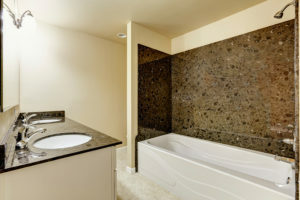 If you’ve been dreaming of a bath remodel that transforms your dingy or outdated bathroom into a luxurious space that you look forward to using every day, your first step will be to find a reliable remodeling company. This investment is an opportunity to turn the bathroom in your Hilton Head home into a space that reflects your unique needs, so don’t settle for cookie-cutter solutions. Instead, call Porch Outfitters for a truly custom remodeling experience from a team of highly experienced professionals. When you turn to us for a bath remodel, we’ll begin the process by discussing your needs and wants in-depth. We’ll take the time to educate you on the options that fit your budget, so you make the best possible decisions for your home. You’ll also be able to view samples and examples of other projects to get inspiration. Once you’ve settled on a design for your new bathroom, our team of experts will begin the construction phase. We only use our own factory trained technicians – not subcontractors – to ensure all projects are completed in accordance with our exacting quality standards. Upon completion of the project, we’ll provide you with a lifetime workmanship warranty in addition to passing along any manufacturer warranties. Learn more about the benefits of choosing Porch Outfitters to perform a bath remodel in your home in Hilton Head. Contact us today.